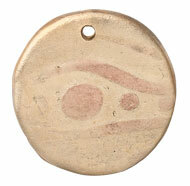 Copper and bronze metal clays have such rich color. I love working them both into one design. There are lots of ways you can make each of these charms--I hope you enjoy exploring and testing out your own ideas. 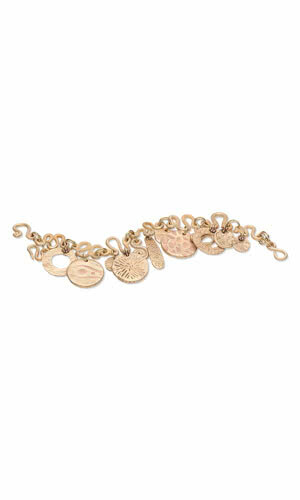 The design of the bracelet is based off of simple links. Rolling out clay and then forming the links is a little tricky as the clay doesn't like to be told what to do. Take your time, practice and soon you will have more links than you'll know what to do with. Make sure the work surface is free and clear of oil and any metal clay. Pinch off a piece of conditioned bronze. Using your fingers, roll the pinch into a snake. Place the snake onto the work surface. Using the snake roller, roll and gently press down on the snake, thinning it out until it is the thickness you desire. Cut a 5-inch length from the snake. Trim the ends at an angle so they taper. Using your fingers and tools (and water as needed), shape the section into a squiggle chain link. Set the link aside to dry. 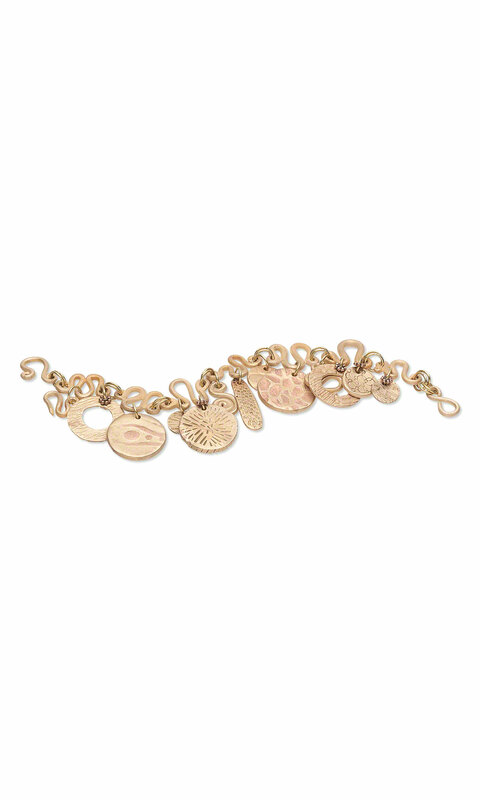 Repeat to make as many links as you need for your bracelet (plus a couple extra, just in case) as well as a few shaped for use as charms. Once dry, refine until smooth. Make a thin snake. Cut a 6-inch length from the snake. Using the roller, taper the ends to a fine point. Roll one end in on itself, for 2 - 3 revolutions. Roll the other end in the opposite direction, until it meets up with the first rolled section. Form a hole in the center of one section to be used for hanging it after firing. Let dry. Refine if necessary. Pinch off a piece of bronze or copper clay. Roll out to 12-cards high. Oil the texture plate and place it onto the surface of the rolled out clay. Roll out to 9-cards high, so the impression is clean. Transfer the textured clay to a non-stick worksheet. Cut to your desired shape. Using an awl or straw, place a hole in the charm. Set the charm aside to dry then refine to a smooth finish. When combining bronze and copper, there are a few guidelines which are best to follow for successful designs. When creating designs like the "giraffe charm," it is best to use bronze as the base and fill in recesses or design areas with copper. This is due to the higher shrinkage rate of the bronze clay. In this case, the shrinkage tends to equalize even though copper has a lower shrinkage rate than bronze. When creating a design with a backing layer where the two different clays are stacked on top of each other, it is best to start with copper as bronze has a tendency to warp, which would cause the design to not turn out well. Pinch off a piece of bronze, the size of a strawberry. Roll out to 16-cards high. Oil a deep texture sheet and place it onto the surface of the rolled out clay. Roll out to 13-cards high so the impression is deep and clean. Using a straw, place a hole in the charm. Set the charm aside to dry. Once dry, deepen the texture with tools. Fire the piece according to the BronzClay firing instructions. 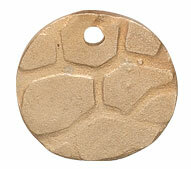 Fill in the texture of the fired piece with copper clay. Smooth out. Let dry. Sand the copper until the surface reveals the pattern. Refine to a smooth finish. Fire the piece according to the CopprClay firing instructions. View instructions on creating drum beads.